This is the same Michael Horton who edited The Agony Of Deceit, which informed us very well about the practice and theology of Charismatics. 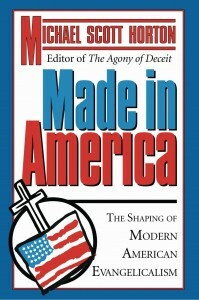 This time, as author, Horton focuses on America as a whole and its growing atheism. I think he does us a service by reminding Christians not to sell their souls to democracy. The founding fathers were not always the fundamentalists they have been made out to be. Horton also takes the reader through the growth of anti-Christian thinking movements and beliefs that have moved this country into its post-Christian era. The chapters on consumerism and self-esteem are filled with excellent source material for illustrating this movement. Horton has an overriding (actually overbearing) theory, to which I take objection, as to why America has taken this decline. For him, all American history is traced to one of two sources. Godliness and morality are linked (almost directly) to the Puritan spirit of the Great and Second Awakenings. Whereas all ungodliness and immorality are linked (very directly) to the supposedly Arminian result of the Enlightenment. From these assumptions the author attributes great spiritual advancements to Jonathan Edwards and George Whitefield but blames humanistic attitudes on John and Charles Wesley. Anything within the New England Reformed tradition is praised as helpful and anything less Calvinistic is labeled as harmful. Lumped together in the latter category are names ranging from Chafer and Falwell to Marilyn Ferguson and Paul Yonggi Cho. Hardly fair we think.